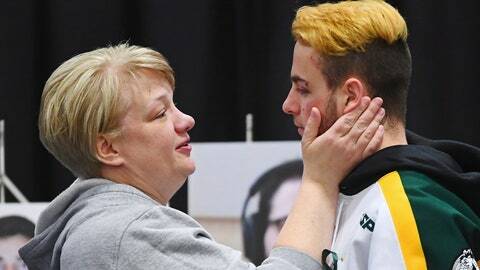 HUMBOLDT, Saskatchewan (AP) — After prayers and songs filled the Saskatchewan hockey arena, Carol Brons spoke as a grieving mother. Her daughter was one of 16 people who died when the Humboldt Broncos junior hockey team bus collided with a semi at a rural intersection. Thirteen others were injured. Brons spoke Saturday at a memorial marking the anniversary of the collision and described the day as a milestone. “Not a joyful milestone, but one of perseverance, faith and courage,” she said, standing beside Celeste Leray-Leicht, whose son also died. The crash brought the nation and the world together in grief, Brons added, and got people talking about the importance of mental health and changes in transportation. “Good must continue to come from this,” she said. The Broncos were on their way to a playoff game when a semi driven by a novice trucker barreled through a stop sign and into the path of the bus. Jaskirat Singh Sidhu of Calgary was sentenced last month to eight years for dangerous driving causing death and bodily injury. The three prairie provinces have since made training mandatory for commercial truck drivers and an entry-level national training standard is to be in place next year. The federal government is also to make seatbelts mandatory on new medium and large highway buses in 2020. The memorial service at the Humboldt rink started with a moment of silence at 4:50 p.m., the time of the collision. Rows of yellow banners were suspended above the main entrance with the names of all 29 people who were on the bus that day. Canadian Prime Minister Justin Trudeau lauded the “courage and professionalism” of first responders and the resilience of the community. Conservative Leader Andrew Scheer pointed to the outpouring of support from across the country, while expressing his own difficulty making sense of the loss. “As a parent and a Saskatchewanian, I still find myself without adequate words to capture how this tragedy has been felt by our province, and our nation,” he said in a statement.